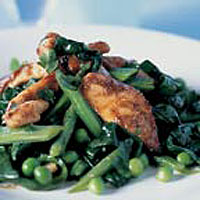 For a more substantial meal, serve these fragrant, spicy strips of chicken and stir-fried greens with basmati rice. In a bowl, make a paste with the five spice, honey and half the oil. Stir in the chicken and salad onions. Cover and leave to marinate for between 30 minutes to 2 hours in the fridge. Preheat the grill to high. Spread the chicken over a foil-lined grill pan. Place about 5cm under the grill. Cook for 10 minutes, turning and basting with the marinade until the chicken is golden and thoroughly cooked with no pink meat. Meanwhile, cook the beans in boiling water for 5 minutes. Add the peas and cook for a further 1-2 minutes until just tender. Drain and rinse under cold water. Heat the remaining oil in a wok on a high heat. Add the chicken, beans, peas, coriander and spinach and stir-fry for 1-2 minutes until the spinach just wilts. Serve immediately.